Thank you! for give us the opportunity to work for you. We hope our work was satisfactory and accomplished your quality expectations. To pay by credit Card Please follow the instructions. 1.- Select your payment and Click on the “Pay Now” button under selected option. 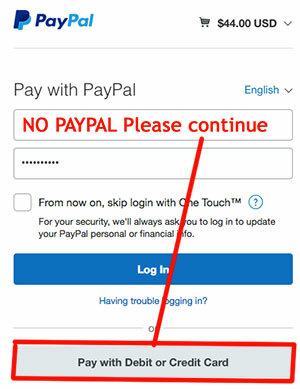 2.- A window will open; Don’t worry if you don’t have a PayPal account just Click pay with debit or credit at the bottom of the form. Yes! it is secure, convenient and easy. Once payment is completed turn around is about 48 hrs depending on the amount of images. Please be aware if are in NY, OR, MI Paypal may add a state tax attach to your payment. PAID $175 (you get tow files per image for web and print) Full retouch including hair, flyways. PENDING: $448.00include extra retouch image in addition of the 3.